The humans sneak into the barn to watch the nisse celebrate. The odor inside the barn would have dropped a city kid to his knees, but these farm kids weren’t bothered by the smell produced by the milk cows. They slowly walked down the center of the barn between the 30 cattle, settling behind a gate with slats. From here they watched the nisse activity and listened to the party. Four of the men sang in harmony as the rest looked on with love and admiration. One oil lamp lit the area with a small glow also coming from a hibachi type cooker. On the grill was a husky cod, slowly heated to feed all twelve; well, 11 plus the baby. The kids still didn’t know that they were detected, and their aunt surely wasn’t going to tell them. The child lay near the gate where the humans sat, someone always watching and holding the little Inga. That’s what the kids heard them call her. 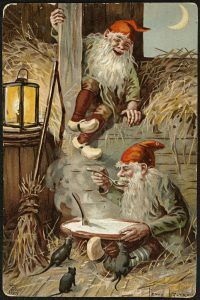 Births rare in the nisse group, nisse often living to age 200. It must have been born in the last month, so small but so content and quiet. Voices of the celebrants were high-pitched and quick, hardly understood by the kids and Marianne. Dancing, singing, fiddle playing, and talking, lots of talk and laughter. Once a year they met, and they enjoyed every minute of Christmas at midnight. Their joy greater than ever with the presence of Inga, watching her mother breast feed her when Inga fussed. One of the older women took the cod from the cooker, cut it, and distributed it. Each person had a spoon and a board as a plate. The baby’s mother lay some on her board. Eating it, she chewed and fed it to her infant in a pulverized form. The 11 nisse as one looked toward Marianne behind the gate. OK, good! 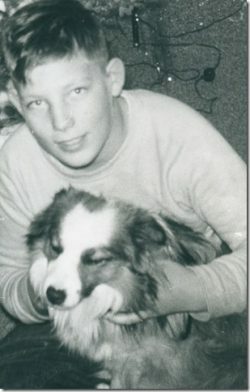 I found part two. 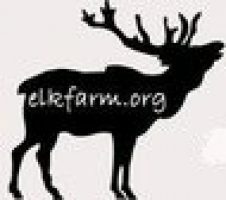 On to the conclusion..
Hi Cari, having trouble getting the blog going, and it opens with elkfarm.org but not if a person puts the www in front of them. Will run off all three parts of the nisse story and get a good copy to you. 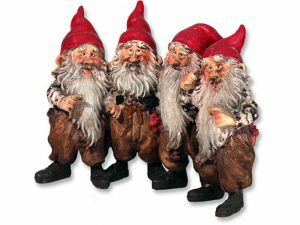 They’re like the garden gnomes you see around, and there’s more to them that I’m not aware of.